I decided to stalk some familiar faces for some inspiration and boy, am I happy I did that! The first person I went to for inspiration is the Season 8 winner of MasterChef USA, Dino Angelo Luciano. He was described by Gordon Ramsey as “MasterChef’s dark horse.” In the end, it was his roasted pistachio tiramisu with orange mascarpone cream, espresso caviar, and a pistachio tuile that beat Eboni Henry and Jason Wang’s dishes, and crowned him the winner. Dino served up a soup he calls his favorite. We call it Kabocha squash soup! Preheat oven to 400 degrees Fahrenheit, toss in oil and roast kabocha, carrots, onion, & garlic for 45 minutes or until soft enough to cut with a butter knife. Stir vegetables halfway through to prevent burning. 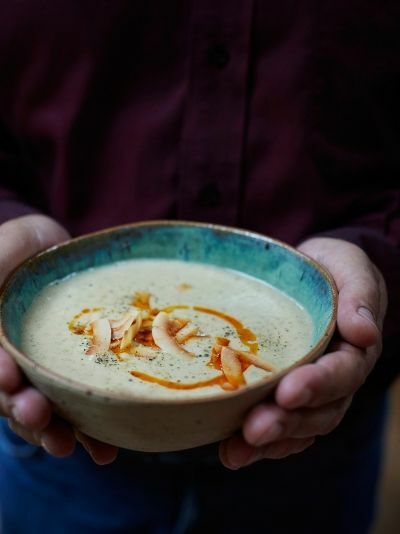 In a blender, puree roasted vegetables with almond milk to a creamy smooth soup texture. Add soup to pot, add all other ingredients and cook on low heat for 1 hour to marry flavors and reduce to desired thickness. This next one is from Georgina Hayden’s Stirring Slowly: Recipes to Restore & Revive. Georgina is a cook, food writer, and stylist from North London who spent 10 years with Jamie Oliver on his food team. This recipe is hearty and homey, and anything that has “restore” and “revive” in it has my vote! Preheat your oven to 180°C/350ºF/gas 4. Peel and cut the onions into 1cm wedges and trim then cut the cauliflower into even-sized florets. If it has the leaves on, don’t cut them off, roast those too. Place it all in a roasting tray with the unpeeled garlic cloves and sprinkle with the cinnamon and ras el hanout. Season well, and drizzle everything with a good glug of olive oil. Toss it all together and pop into the oven for 25 to 30 minutes, until cooked through and a little charred. Scatter the coconut flakes on to a small tray and pop into the oven for the last few minutes to toast – they should only need 3 to 4 minutes. When the veg is ready, remove the garlic cloves and scrape all the veg into a large saucepan. Squeeze the garlic out of its skins and add them too. Pour in the coconut milk, add the stock and gently bring to the boil. Reduce the heat a little and simmer for 5 minutes, then remove from the heat. 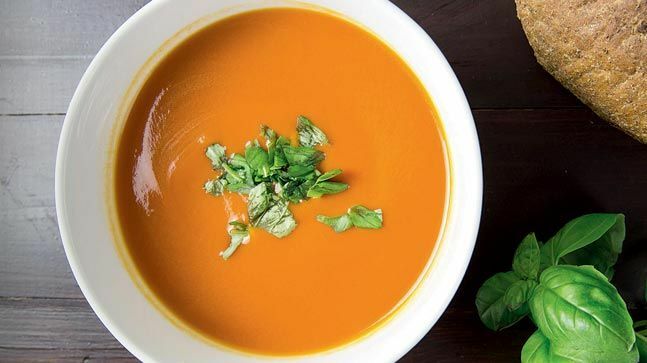 Using a stick blender, blitz the soup until creamy and smooth, adding a splash more water if it is too thick. Taste and adjust the seasoning, and serve topped with the toasted coconut flakes and a drizzle of chili oil. Lastly, we have a proud South African recipe that is truly my favorite! Prepare a grill for medium to low direct heat. Using a Weber Wok Melt the butter and add the flour. Stir over a low heat for one minute (ensure it does not burn). Add the black pepper, nutmeg and ground coriander. Stirring continuously, gradually add the milk and the stock. Stir over low heat until thickened and remove. Add the cheese and 200g of the biltong keep warm until ready to serve ensuring soup don’t boil. Add cream to taste, just before serving. Top each serving with a generous sprinkling of grated biltong. Snuggle up and enjoy with your vinas!